IrMn-based vertical devices, comprising an IrMn layer, a tunneling barrier (MgO) and a non-magnetic layer (Ta or Ru) forming a so-called AntiFerromagnetic Tunneling Junction (AFTJ). 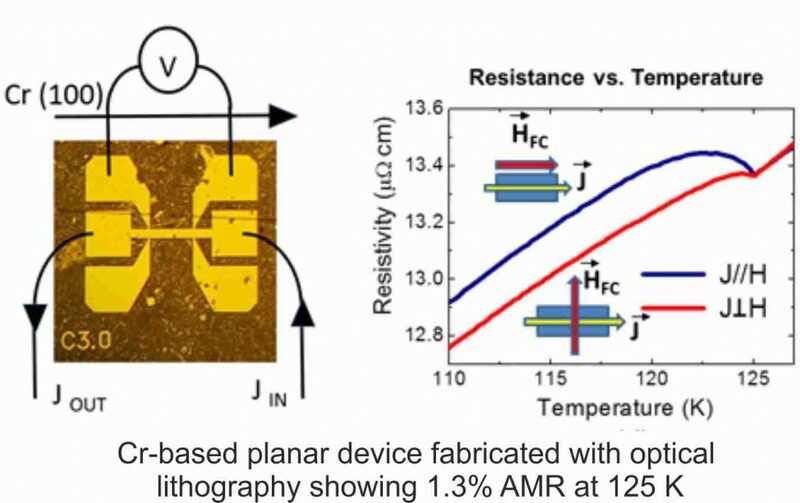 The information is stored in the IrMn spin alignment (parallel or perpendicular to the current flow in the device) by field cooling and read by anisotropic magnetoresistance (AMR). The main goal of the project is to realize such devices on Silicon platforms, looking for CMOS compatibility, and with operation temperature larger or equal than room temperature. 1.3% AMR below 125 K in a thin Cr film. 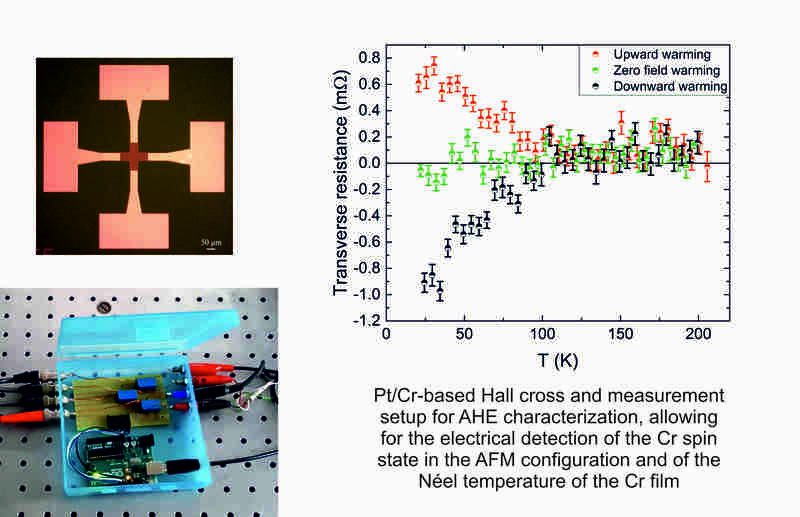 This constitutes the first prototype on an AFM memory entirely based on Cr. Magnetic proximity effects at the Cr/Pt interface, resulting in a net magnetic moment induced by the AFM Cr in the Pt underlayer. A measurement system based on the detection of the anomalous Hall effect (AHE) in Pt has been appositely designed and realized in the framework of this project. 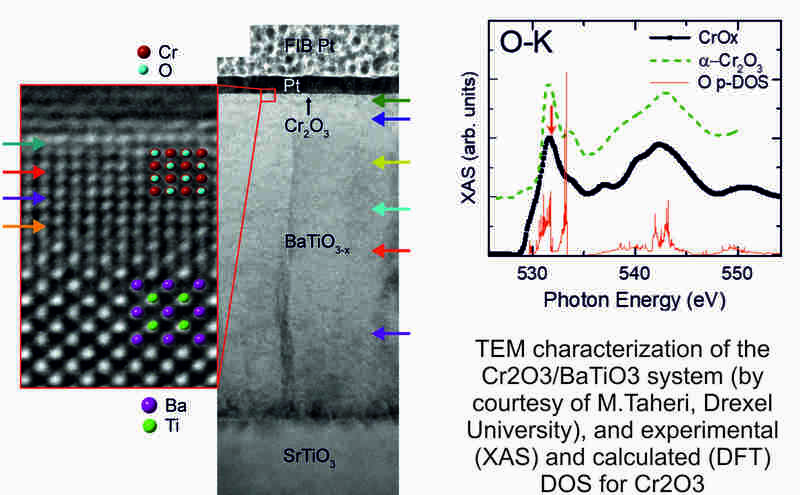 Deposition of Cr and Cr2O3 films on ferroelectric BaTiO3 underlayers, in the search for the electric control of the spin state. Moreover, ab-initio calculations and experiments addressed alternative ways of information writing (magneto-electric coupling), as well as novel materials (Mn2Au, GeTe, CuMnAs) and techniques (tam-SPL), in order to propose innovative strategies pathways to be followed and experimentally investigated. D. J. Groenendijk, C. Autieri, J. Girovsky, M. Carmen Martinez-Velarte, N. Manca, G. Mattoni, A. M. R. V. L. Monteiro, N. Gauquelin, J. Verbeeck, A. F. Otte, M. Gabay, S. Picozzi, and A. D. Caviglia: Spin-orbit semimetal SrIrO3 in the two-dimensional limit. Phys. Rev. Lett. 119, 256403 (2017).